I used to think that the lamest sequel ever made was Smoky and the Bandit, Part 3, in which Jerry Reed, Jackie Gleason, and various others in the supporting cast from earlier Bandit movies tried to soldier on without the earlier films’ stars Burt Reynolds and Sally Field and director Hal Needham. Now, however, Bandit has pulled over and been passed by The Huntsman: Winter’s War, a sequel to Snow White and the Huntsman without Snow White. To make up for the loss of Kristen Stewart’s heroine from the first movie, the filmmakers import plot elements from far more successful films, including Frozen, Brave, and the various Hobbit movies. Sadly, they failed to import a single bit of the cinematic magic from those films. Drafting a script for Winter’s War was a challenge for writers Evan Spilitopoulos and Craig Mazin. Not only was Kristen Stewart gone, but Snow White’s most entertaining character, the evil queen Ravenna (Charlize Theron) dies at the movie’s end. Their solution was to make Winter’s War as both a prequel and a sequel to Snow White, an idea that plays as bad as it sounds. The first 45 minutes of Winter’s War takes place several years before Ravenna did battle with Snow White in the first film and focuses on the relationship between the evil queen and her sister and fellow queen, Freya (Emily Blunt). Freya is kinder and gentler than Ravenna (not all that difficult), but after her child is murdered, her heart turns to ice (almost literally). Freya discovers she now has the power to freeze people and turn her kingdom into a winter non-wonderland. Like a modern day African despot, she starts kidnapping children and training them to become her soldiers. Freya has one big rule; no one can feel any genuine emotion. Naturally, this rule falls by the wayside when Freya’s two prize warriors, Eric the Huntsman (Chris Hemsworth) and Sara (Jessica Chastain) fall in love. An enraged Freya seemingly kills Sara and banishes Eric, where he winds up befriending Snow White. Fast forward seven years, and Snow White now rules Ravenna’s kingdom, and Freya is as power hungry as her sister ever was. She wants her sister’s mirror, which can give her the power she needs to conquer Snow White’s kingdom. Apparently, the mirror was sent on a perilous journey to some secret location where it could be kept safe, thus allowing it to be easily stolen by goblins (the type of ridiculously moronic plot contrivance that abounds in these films). Eric, accompanied by several dwarves, goes on a mission to retrieve the mirror. Along the way, he joins up with Sara, who, we learn, wasn’t really killed years earlier. Instead, Freya just wanted Eric to think she was dead so he would feel that much worse. Eric and company get the mirror back from the goblins and promptly have it stolen away by Freya, who takes it back to her castle. There, she uses the mirror to bring Ravenna back to life and thus give the movie some badly needed life of its own. By now, you can probably recognize the similarities between Winter’s War and Frozen. Ravenna and Freya are much darker versions of Anna and Elsa. And if I mentioned that Sara has bright red hair and boasts a bad Scottish accent, you’ll note her resemblance to Merida from Brave. In addition, the audience is treated to bickering dwarves on a treasure quest, just like the bickering dwarves on a treasure quest in the Hobbit movies. 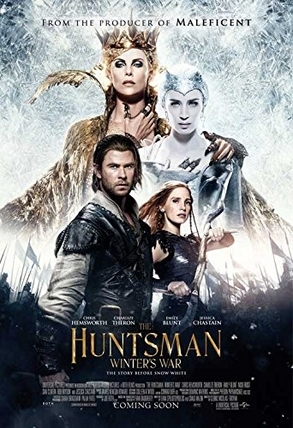 But, while The Huntsman: Winter’s War has plenty of wicked queens and brave warriors, and even a lot of CGI magic to boot, it’s missing a more basic kind of movie magic, the type that made those other movies so much fun to watch. It’s the type of wit and flair that Disney and Peter Jackson know how to infuse into a movie, but Winter’s War director Cedric Nicolas-Troyan does not. Instead, he puts most of the burden of carrying the movie on the admittedly large shoulders of Chris Hemsworth, who has the requisite look for the role but gives an extremely leaden performance. Hemsworth’s performance matches the overall somber tone of Winter’s War. It’s a gloomy film, filled with unhappy people, with far more of an emphasis on death and suffering than you’ll find in most fairy tale movies. Charlize Theron and, to a lesser extent, Emily Blunt do their best to alleviate the mood with some over-the-top wickedness (the film suffers a lot during the hour or so in which Ravenna is dead), but the absence of a suitable hero drags it down. At least, the producers introduced Nick Frost and Rob Brydon as Eric’s squabbling helpers, and they get what few laughs there are in the movie. From a technical standpoint, Winter’s War looks good. The CGI effects during the extended action finale are effective, and the action is better staged than in most films of this nature. Best of all, however, are the dazzling costumes that Ravenna and Freya wear throughout the movie. Colleen Atwood got an Oscar nomination for her work in the first Huntsman movie and could easily get another here. The Huntsman: Winter’s War is far from the worst movie around, but it’s certainly one that was in the least demand, after the middling reception its predecessor received. Certainly, Chris Hemsworth’s availability is a big selling point, but, in all honesty, he has yet to prove himself a box office draw in any role other than Thor. And, his acting skills leave a good bit to be desired as well (note to Hemsworth and Jessica Chastain: leave Scottish accents alone). Without a strong lead performance and with an extremely convoluted and overstuffed plot, Winter’s War merely lurches along for two hours. This is one project that should have stayed on ice. © 2015 Steven R. Silver. All rights reserved.